Nature is steadily reclaiming the disused Pooley Pit workings along the Coventry canal near Polesworth. Ponds form in pit subsidence. Trees colonise the spoil heaps. Wildlife returns. 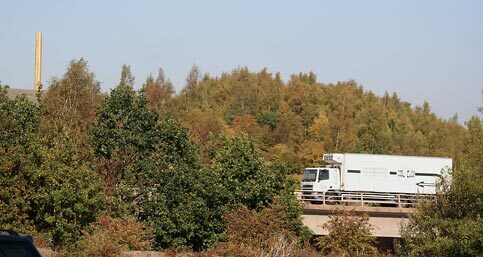 Drivers on the adjacent M42 watch a new forest appear. Last September a 40 foot yellow chimney appeared over the trees. 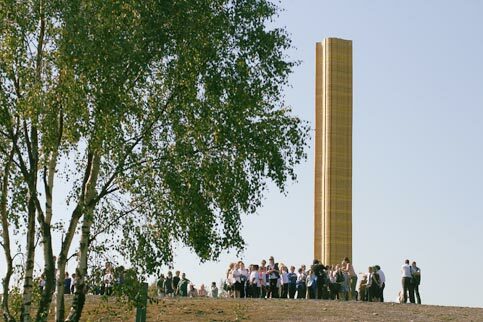 Gold Leaf Buried Sunlight, by Dundee based sculptors Matthew Dalziel and Louise Scullion, is made up to look like a column of golden birch leaves. But it’s really painted fibreglass – a wise construction decision. Metal would have cost even more than the £110,000 the local council paid, and caused greater wildlife disturbance. Click here for a time lapse video. At least it has no sound system. Dalziel and Scullion’s environmental land art is often noisy. 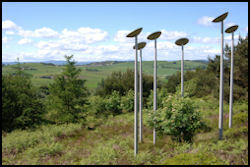 Modern Nature (six aluminium lamp posts with solar panels on top) sits on Elrick Hill in Tyrebagger Forest near Aberdeen. The Tyrebagger Trust, a lottery funded offshoot of the Forestry Commission, paid £1m for it and another 14 similar sculptures in 2001, and then went bust. After a bit of grumbling Aberdeen Council took on maintenance, and agreed to pay for insurance if a panel brained a walker. Originally a sound system broadcast the call of the capercallie as visitors approached, but it soon broke down, and the council haven’t bothered to repair it – no doubt to the capercallie’s relief! 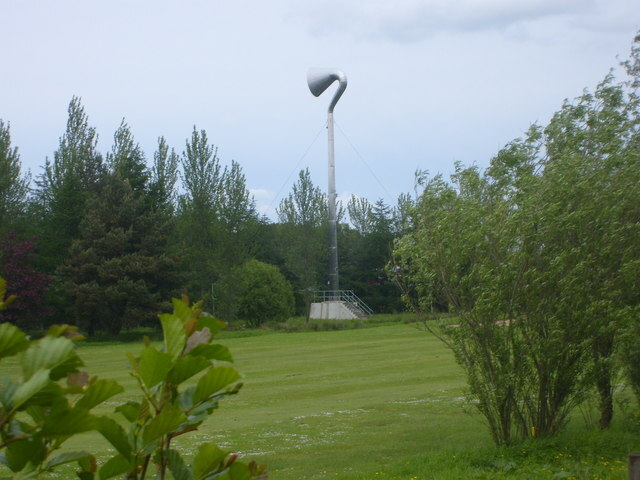 The 80 foot Horn in Polkemmet Park, between a golf course and the Glasgow to Edinburgh M8, cost West Lothian Council £150,000 in 1997. It originally emitted snatches of birdsong or politically correct quotes; “A tree burning in the Amazon alters the air in Paris”; “It’s a whole new way of life” but to the relief of the golfers that’s also stopped working. I doubt the wildlife mind. Generally left wing councils go in for this sort of thing. But the Pooley Park Chimney was driven through Warwickshire County Council by Tilly May, the Conservative member for Polesworth. If you live locally don’t waste your vote.